Print collaboration is when a skilled artist works with a skilled printer to create a print that neither could make on his or her own. The artist has their own concepts and style of working, that is uniquely theirs, but their grasp of the technical aspects of printmaking and lithography may be thin. The master printer has all the technical skills under their roller and may be a specialist in a particular field such as hand lithography, but their own artistic abilities may be limited to doodling on a notepad. The two are experts in their independent fields and come together at the press to make something that is greater than the two halves, to allow the artist full expression with print. Collaboration allows the artist to focus on the image while the printer makes sure that it is technically possible. 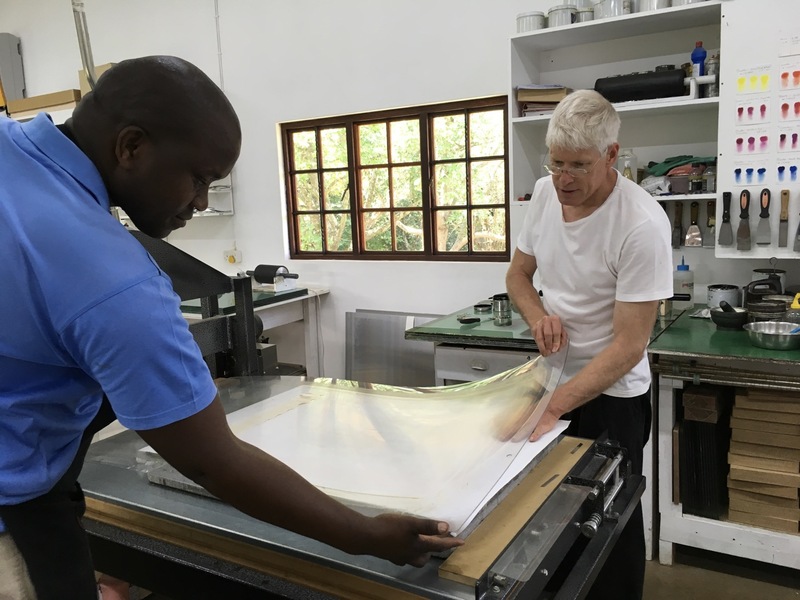 At The Artists' Press, the Master Printer who collaborates with artists is Mark Attwood (a Master Printer trained in collaborative printmaking at The Tamarind Institute, University of New Mexico). Artists are invited to work at the studio and the collaborative process usually lasts about two weeks. The artist and printer work closely together during this time, exploring techniques that best suit what the artist has in mind. Print collaboration works best when both artist and printer are open to new ways of doing things and are flexible in their approach. This is an aspect that Attwood finds particularly exciting. From collaborating with Robert Hodgins, Mark Attwood has worked out a new technique to meet the needs of artists who are primarily painters. He explains "This method was born out of the frustration of trying to find painterly ways for artists to work with, that would allow them to get the sort of marks that they achieve when they paint". Judith Mason now has a printing technique that she can really extend herself in. Mason says that the process is " Much more satisfactory for painters because you don't fill in colours or have to anticipate how colours will work in the "abstract". You are able to see instantly how the colours will interact and the gesture making typical of most painters is allowed to develop in ways that even experienced painters find exciting." The artist works onto a sheet of clear plastic with coloured inks with the image reading the same way that it will be in the final print. They work with the actual ink colour that they will use on the final print (as opposed to working in black pencil or tusche). Mark adds, "this allows the artist to see what they have and what the print will look like as they build it up". When the artist is satisfied, the image is transferred onto the printing plate, the plate is processed, and the proofs are pulled. The results of a successful collaboration speak for themselves. Lithography is a very versatile process and the range of possibilities can be seen in the range of work that is available from The Artists' Press. Mark Attwood is a brilliant printer and his range of skills can be seen in the variety of the work that he has collaborated on, from the assemblages of William Kentridge, the monoprint transfer prints of Robert Hodgins, to the smoky landscapes of Kim Berman and the fine line drawings of Judith Mason. Not to mention the "smoke prints" of Diane Victor's which stretched Attwood's creative technical skills almost to the limit. Once the artist is satisfied with the print they sign an approval to print, this is the "master- copy" that the edition printer will refer to when editioning the print. The artist then leaves the studio and the edition is printed. Once it has been curated (to make sure that all prints to be signed are the same quality as the approval to print) the artist then signs, titles and numbers the prints that are then ready for sale. A broad definition of collaboration is a process where two or more people work together in an intersection of common goals — for example, an intellectual endeavour that is creative in nature—by sharing knowledge, learning and building consensus. It is the act of working jointly, to work together on a common enterprise or project. 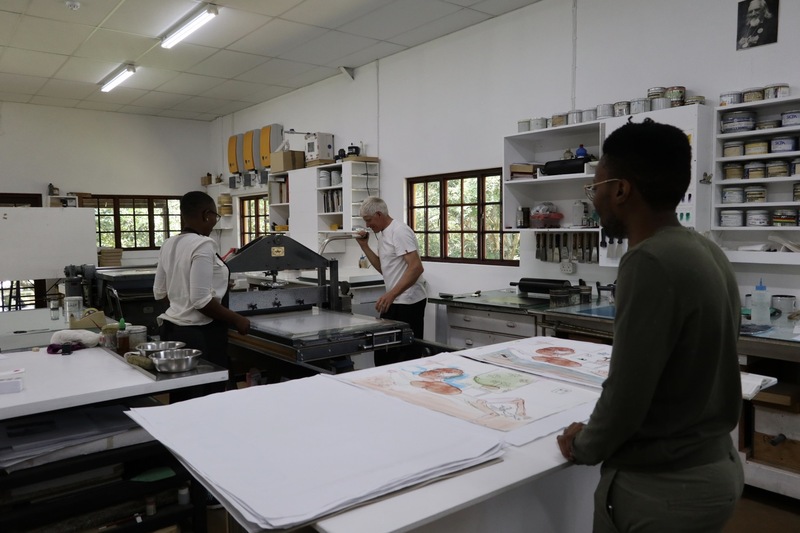 Hazel Sibande and Mark Attwood proofing a print for Banele Khoza. 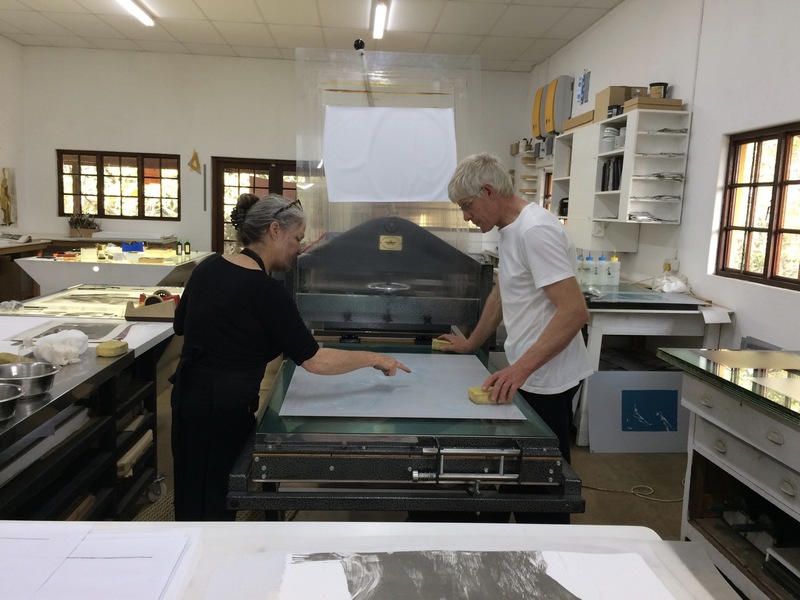 Deborah Bell discussing details on the plate whilst proofing with Mark Attwood. Jacky Tsila assisting Mark Attwood with proofing. 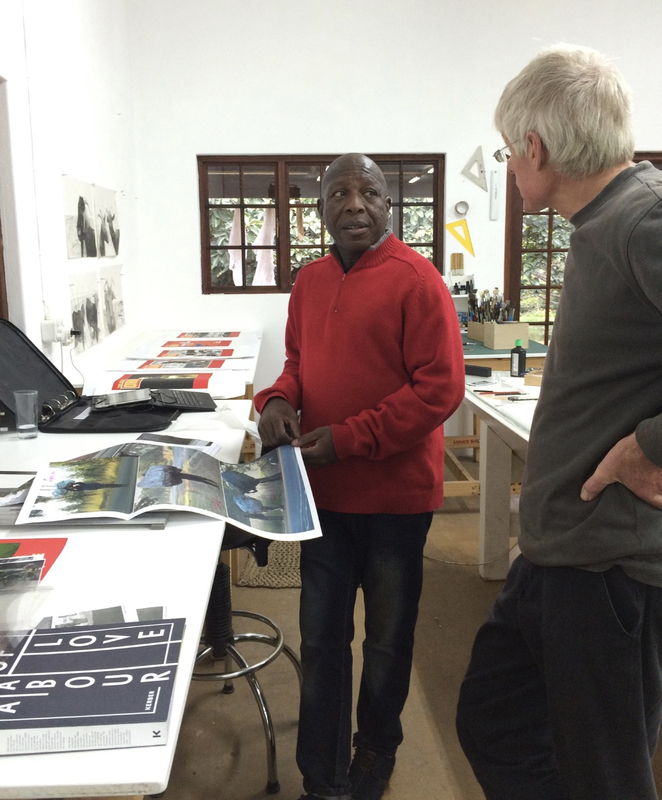 Sam Nhlengethwa discussing his Recyclers series with Mark Attwood. 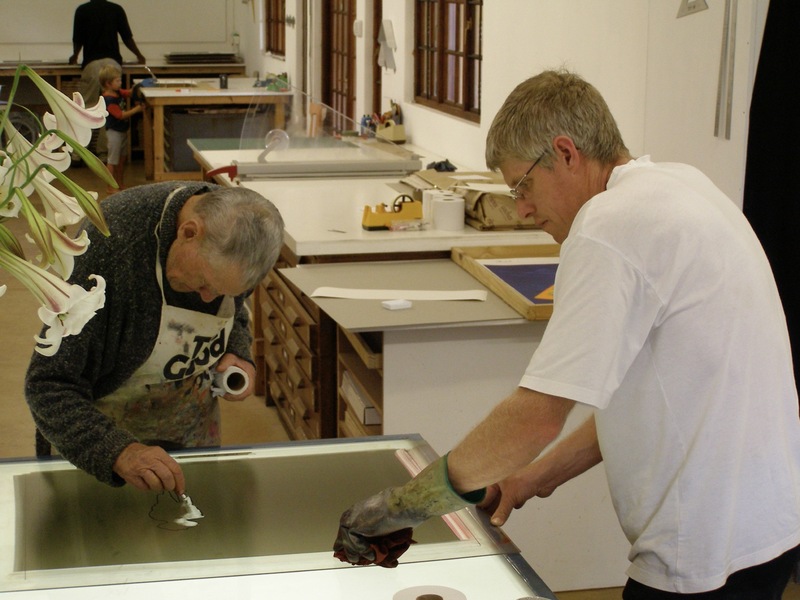 Sam is the artist that Mark has collaborated the most with over his career as a Master Printer. 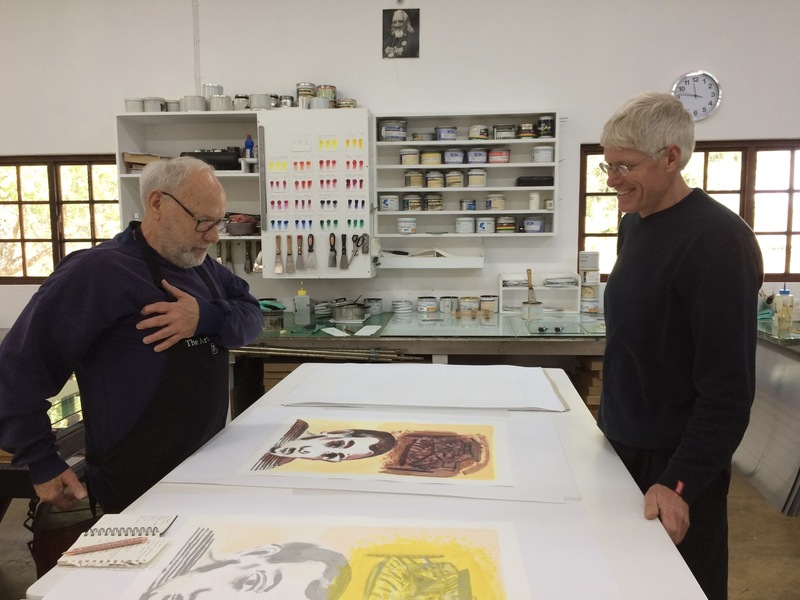 Andre Naude and Mark Attwood engage with monoprinting. 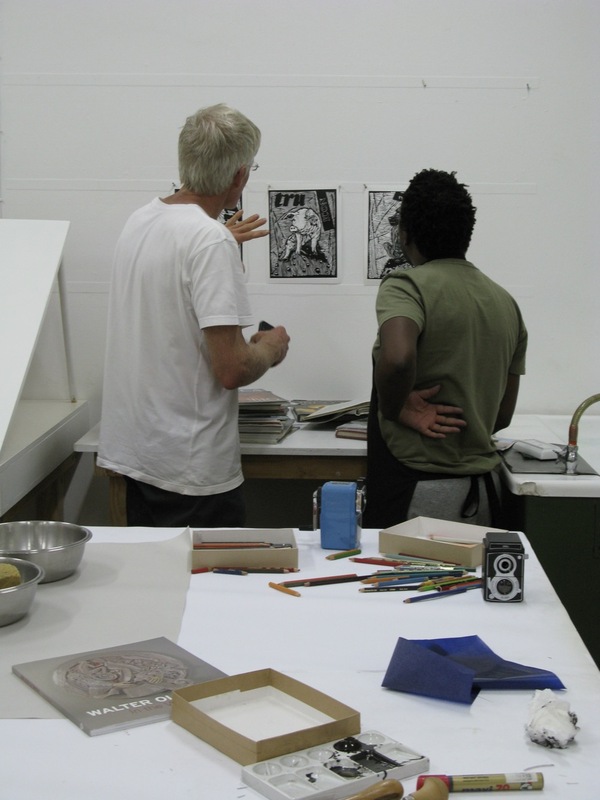 Mark Attwood and Colbert Mashile discussing Mashile's lino cut prints.